← September 14, 2018 – The WOW Emmy Gift Suite – The W Hotel – Hollywood, CA. 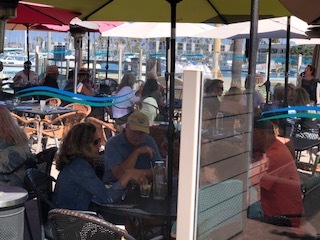 September 16, 2018 – Waterside Restaurant – Brunch – Channel Islands Harbor – Oxnard CA. A super fun filled restaurant with an amazing brunch. The patio was buzzing with lively mimosa drinking fans of the music and the food. 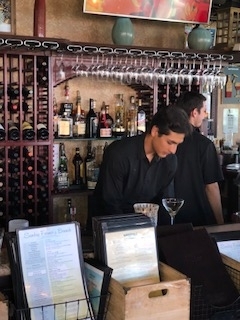 Its right on the Channel Islands Harbor in Oxnard, a true must for any Sunday Brunchers. 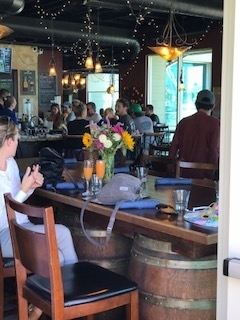 Whether you are a local or it is a brunch destination, Waterside is a great find with a very cool beachy atmosphere. 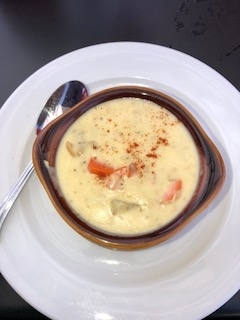 Clam Chowder it won 1st place Chowderfest 2018. Big whole clams and a great creamy soup, I would order this every time. Roasted Shrimp Cocktail, 5 large oven roasted shrimp with house-made cocktail sauce. 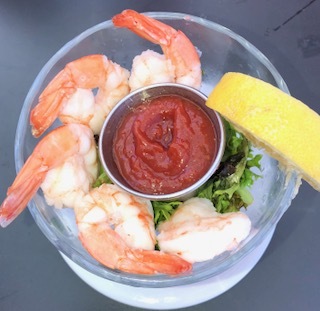 These shrimp are huge and delightful; a nice way to start your experience. 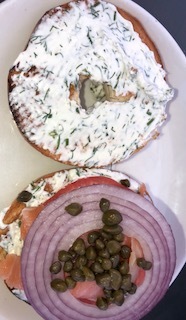 Bagel with Lox & Herbed Cream Cheese, with capers, tomato, and red onions. The best part about this is the herbed crème cheese, really a winner. Waterside Caesar Salad, Chopped romaine lettuce, Parmesan cheese, house-made dressing, and brioche croutons. This salad is on of my favorite items, with nice bog grilled shrimp and the dressing is superb. 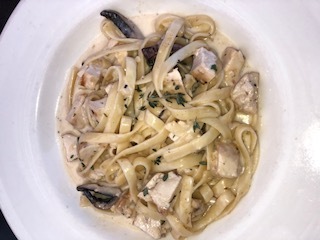 Fettuccine Alfredo, Served in a cream sauce with forest mushrooms and grilled chicken. This is a very rich dish so I would do this as a share first course. Surf & Turf Burrito. Fillet Mignon, shrimp, potatoes, eggs, cheese, and hollandaise. Served with tortilla and house-made fire-roasted salsa. Not my favorite thing on the menu but the plump shrimp makes up for tough steak. 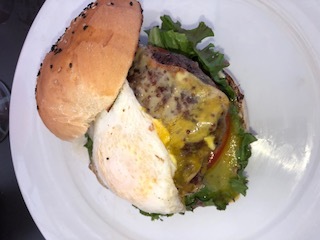 Waterside Brunch Burger, Ground chuck, red dragon cheese, lettuce, tomato, red wine onions, Dijon aioli, fried egg, on a brioche bun, choice of fruit or potatoes. A perfect burger, huge patty with all the fixings a definetly winner. They did brunch item that was not on the menu that I really loved. It was bread, egg, sweet paotao and bacon, with a thyme rosemary crust. Super light and delicious, who knows maybe they will name the dish after me. Sausage Links & Bacon, basic but hit the spt. Organic Cucumber Cosmo, Organic cucumber vodka, triple sec, fresh lime juice, simple syrup with a splash of cranberry juice. Shaken and served up. A nice rendition of this popular drink with the floating pulp it makes it pretty tangy. Waterside Pine-Tai, Pineapple Bacardi rum, pineapple & orange juice, splash of grenadine, squeeze of lime. Topped with Meyers Dark rum float. Served on the rocks. This would be my go to, with the wharf backdrop and all of the water and boats this drink makes you feel like you’re on a real vacation. 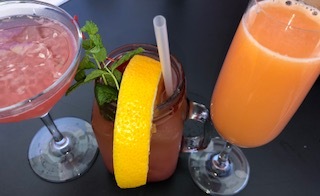 Blood Orange Mimosa, these Mimosas are bottle less and come around as often as you can say more, the fresh blood orange juice makes it go down real easy. Melanie was my server she was super efficient and extremely busy, but got the job done. It is a very lively crowd, families, dogs, puka-shelled men, with football playing on many screens in the inside at the bar. A great festive way to brunch! 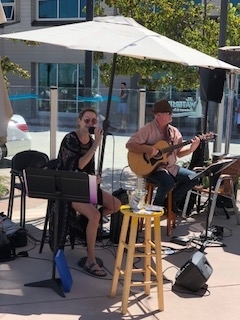 If I lived close by you bet I would be here every Sunday, with live music and a great vibe, Waterside Restaurant has my seal of approval, big time. It is really worth a trip to Oxnard to experience this laid back feeling that all if great in the world. 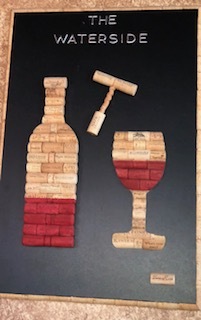 Spend a Sunday, its only an 1 hour and a half away, you will feel like you took a much needed vacation, but with out spending all of that hard earned money.